No part of this publication may be reproduced, distributed, or transmitted in any form or by any means, including photocopying, recording, or other electronic or mechanical methods, without the prior written permission of the author. When I first sat down to write the beginning of Aaron’s adventure, I never imagined it would get the kind of response it did. For this reason, I would like to first and foremost thank everyone who read Run To Earth. To all those wonderful people who gave my book a chance, thank you from the bottom of my heart. Playing With Fire would probably still be in my head and not on paper, if it wasn’t for a few very special people in my life. Thank you to my mum and dad for their unconditional love. Thank you to my wonderful husband, Mazhar for encouraging me to keep on writing. A big thank you to my sisters; to Yasmeen for always being there for me, and to Samena for being the one I can always come to. To my M&Ms, mummy couldn’t be more proud of how supportive you all are. To my friends, thank you for being the best friends a girl could ask for and for sharing my excitement. A massive thank you to Gerard Donnelly from Ginger Creative Agency, for designing the gorgeous cover. 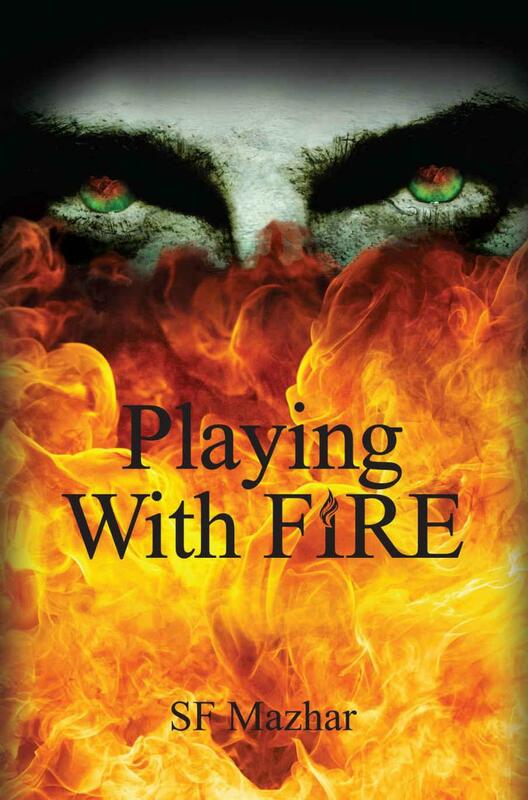 Thank you to Melissa Hyder for editing Playing With Fire, and for going beyond the call of duty to answer all my questions. And a big thank you to all the readers that are prepared to go with Aaron on his journey. The purr of the motorbike cut through the air. Stationed outside the main doors of the impressive manor, the three vamages stilled, superior hearing strained to catch the growing sound. They moved as one, stepping down the stairs and onto the lush garden, to see the single bike coming towards them. “Get Machado,” one of them instructed when he recognised the bike, and the dark-haired boy riding it. One of three vamages turned and raced inside. The other two tensed as the bike came closer. The doors behind them opened and Daniel Machado, the right-hand vamage of Hadrian, stepped out. His glittering blue eyes fixed on the biker approaching them. The heir to the Aedus bloodline, the only son of their leader, the boy others referred to as the Scorcher – but to Machado he was, and always would be, the insufferable Kyran Aedus. Kyran came to a stop and cut off the engine. He lifted himself off his bike and began walking towards them. Machado heard the starved growl behind him. “Easy,” he warned in a low voice. “Control your hunger.” He could smell the blood too, but he had learnt long ago to lock his thirst when it came to the Aedus heir. Seeing the smirk on Kyran’s face, Machado knew the boy could see the strain on the vamages as they tried to hold back and not give in to their bloodlust. It was an old game for Kyran, but one he loved playing nonetheless. Machado turned his head. “Leave,” he instructed. The two vamages practically ran indoors with relief. ,” he hissed as he passed by, heading indoors. Machado stared with disbelief at the purple gem dangling from the chain. “You...you got it?” he asked. He stepped forward, his gaze fixed on the gem – the key that would unlock Hadrian’s powers. “How did you do it?” he asked, reaching towards it. The key was rumoured to always be around the neck of the fierce and powerful leader of the mages – Neriah Afton. Machado didn’t say anything. Kyran gave him a last look full of loathing and walked away, heading straight to his father’s room, slamming the door closed behind him. The City of Salvador was in ruins. Buildings lining both sides of the street had been darkened by fire. The residents were left dazed and shaken by the events of the last few hours. The Controller, Scott Patterson, and his Hunters were standing in a huddled group, talking to Neriah. Watching from a window was Aaron Adams. It had been four months since the fourteen year old had come to the City of Salvador in the mage realm. In that time, Aaron had seen and done things he could’ve never imagined. He’d fought demons, he’d learnt how to split the ground with his powers, he’d learnt how to use a gun, how to fight and defend himself, and he’d learnt it all from the boy who had turned out to be their greatest enemy – Kyran. Kyran was the one who’d taken over Aaron’s training when Skyler Avira used it as an excuse to beat him bloody on a daily basis. It was Kyran who spent hour after hour teaching Aaron how to aim and fire his weapon, how to send ripples through the ground, how to control the element of Earth. Before coming to this realm, Aaron had no idea what being a mage meant. He didn’t know mages had powers so they could fight against demons. Aaron wasn’t even aware that he was in fact an Elemental – one of the four families with complete power over an element. In a strange world of mages, demons and elemental powers, Kyran was the only one that Aaron felt somewhat comfortable around. Aaron had even dreamt about Kyran before meeting him. It was a strange friendship that Aaron had developed with Kyran, one that he didn’t share with anyone else, not even his childhood best friends, Sam and Rose Mason. Aaron turned to see Rose sitting on her bed, in the room they all shared, head leaning on her brother’s shoulder. Her bloodshot eyes made Aaron look away, his heart clenching painfully. Rose had just started a relationship with Kyran, only a day before she found out who he really was. Zhi-Jiya’s voice rang in Aaron’s head. Kyran was the Scorcher, the son of Hadrian, the leader of the vamages – a hybrid species, part mage and part vampire. It was a group of vamages that had killed Sam and Rose’s parents, when Aaron had unknowingly brought the vamages to his street on the dawn of his fourteenth birthday. Kyran, it had been revealed, had been there too that night. Not only was he there when your parents were murdered, he didn’t do a thing to stop the vamages – who obey his every command. Skyler’s taunt to Rose echoed in Aaron’s head, making his insides go cold again. Kyran had come with the vamages. He could have stopped the attack. He could have saved Mr and Mrs Mason, but he hadn’t. He’d let the vamages kill them. Why? There was no other explanation. Kyran didn’t help the Masons because he didn’t care about them. The door to their room opened and Aaron looked over to see his mum walk in, several empty duffel bags in her hands. “Gather your things.” Kate addressed all three of them, throwing a bag each their way. Aaron looked from the bag at his feet to his mum. “What?” he asked. “Pack your things,” his mum said. “We’re leaving.” She stepped out of the room. Aaron had to force himself to stay still and not flinch at the idea of Kyran leading an attack on them. Each and every time Aaron had found himself in trouble in this realm, it had been Kyran who had come to his aid. Despite what had happened a few short hours ago, Aaron still couldn’t accept that Kyran was, and always had been, the biggest threat to the mages. The front door opened and Aaron’s dad, Chris, walked into the living room, two packed bags in his hands. “Ready?” he asked. “Where it’ll be safe,” Kate replied. “You’re forgetting that I’m a Hunter too,” Aaron said. “You don’t get to decide that,” Aaron fought back. Kate looked like the last strand of her patience was about to snap. She took in a breath, pumping her hands into fists. Kate stilled. Pink spots coloured her cheeks but she didn’t say anything. Aaron turned to find his dad looking at his mum in shocked disbelief. At this point, Aaron didn’t care about his reaction either. Leaving his dad looking hurt and stunned, Aaron headed out of the cottage, slamming the door shut behind him. The street was filled with mages. Aaron saw a few of the younger kitchen and orchard workers carrying their belongings in cloth bags, following Hunters towards the open Gate. But as some mages were leaving through the shimmering cut in the air, more were arriving – long streams of bikers entered Salvador; Hunters arriving in the aftermath chaos of Kyran’s escape. The Hunters parked their bikes in the street and hurried towards Neriah, looks of bewilderment on their faces. Aaron stood in the middle of the street, just watching them as the story of Kyran’s betrayal was repeated. He saw the disbelief and horror replace their confusion. After a few minutes, Neriah began to walk away, with Scott by his side. The Hunters followed after them. Aaron’s heart lurched. Just for a brief moment, he had forgotten about Ella’s death. Neriah suddenly stopped in his tracks. He turned to seek out Drake, having overheard him. The look on Neriah’s face was frightening. His violet eyes had darkened and his jaw clenched in fury. A ripple of surprise went through the crowd. Aaron stepped closer, hoping against hope Neriah was right and not just in denial over the death of his niece. Tremendous relief swept up in Aaron, making his knees weak. Ella was a part of Neriah’s bloodline. If she had died, Neriah would have felt it. Throughout the chaos of Kyran stealing the key and escaping, no one had thought to go to Ella. They all just assumed that she was dead.